Review: If you should happen to see a copy of Painkiller floating around the discount bin at your local game store, do yourself a favor and pick it up. Your gut may warn you against picking up a title that boasts the idiotic tagline, “Heaven’s got a hitman”, but the actual game is far less cheesy. Painkiller is very much an old school FPS. Here, there’s nothing but pure action with little else to get in the way, including story. If you pay attention to the long, drawn out cutscenes involving odd-looking human characters, you’ll pick up on the notion that you play a man stuck in Purgatory for some reason who just happens to be the only thing standing between us and an invasion of demons via graveyards, or something like that. It’s that same line of thinking that leads to you getting a shotgun within seconds of starting a new game. Certainly all the archetypal weapons of the FPS genre (shotgun, machine gun, rocket launcher, etc) are represented, but the game also includes a couple oddities, such as the gun that shoots huge wooden stakes, and another that can fire both shuriken and lightning, at the same time even. Even your eponymous starting weapon is a unique and deadly tool. You can spin it like an airplane propeller, fire its warhead to hit distant targets, and embed the warhead in a wall while burning enemies with a beam of energy so long as you keep your sights on the warhead. The levels are separated into chapters that you can revisit at any time from the “map” screen, either because you really enjoyed the panoply of demons you blasted on one level, or because you want to try again to beat a level’s special requirement to unlock a tarot card. Each one grants you either a powerful bonus ability that can be used once per level, or a passive ability that always remains active. It adds an entertaining dynamic to the fighting, although some of the unlocking requirements, particularly those involving the collecting of a certain amount of gold, can get a little annoying. There’s plenty to love about this game: The enemies are well done and widely-varied; the battle music is nothing but face-melting metal; boss fights are truly epic. All the different elements of the game fit together nicely, and what you’re left with is a first person shooter that eschews all the unimportant peripheral garbage glutting up so many modern examples of the genre and gives you glorious violence and explosions, all within a host of fantastic settings. The only downside is the follow-ups that were made for the game. The first, Battle Out of Hell, didn’t really add much to the original, and the second, Overdose... well, they really shouldn’t have charged money for that game. Regardless, even if a sequel never emerges, you can rest assured that Painkiller is a game that you won’t mind playing again years later, when you grow tired of playing as a heavily-armored space marine and/or counterterrorism expert. So the whole point of the game is more based on killing and killing rather than having the player follow a story? Not that it is a bad thing. I actually did find this in a Blockbuster bargain bin, and picked it up about a year ago. Sadly, it was too damaged, and stopped working about halfway through the game. What I played of it was pretty fun though. Checked this one out after Yahtzee gave it a rare positive review. The lightning/shuriken weapon is pretty sweet, and I fully plan to construct my own someday.
" Overdose... well, they really shouldn’t have charged money for that game." This game sounds v. cool, I will look for it. I wish there were more games like this. If I want a puzzle I'll play a puzzle game, if I want a story with great characters I'll watch a movie or read a book. 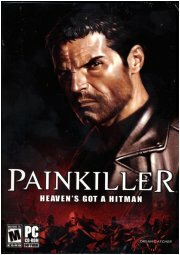 If I want to blow stuff up and impale zombies on the wall, I play Painkiller. I also thought this game was absolutely gorgeous, the intricate level architecture and textures still entrance me. I was able to get the main game and the expansion pack together. I don't think there's another game that can substitute this one when it comes to old-school demon shooting. Also, you forgot that you can launch the Painkiller's warhead while in its awesome propeller mode, dicing through everything along its way. Gotta love how it gibs its way through crowds of monks. The only complaint I have about this game is getting all the tarot cards. Some of them took HOURS of reloads and precarious jumping and timing. Honestly some of the hardest gameplay I've ever experienced. We need more games like this. He's right on all counts. If anyone does have any ideas for games they'd like to see covered, feel free to post it on the boards, or send me an email/PM. Yes, some of the ones that required you to find all the gold/secrets required some BS jumping. The one at the castle comes to mind, as you had to climb to the top of a tower, bunnyhop in a circle until you were moving about 60 mph, then hop your way up a ballista and jump off to a far off tower below. Or the dock level, where you had to climb up those cranes, jump from crane to crane, and time your landing juuuust right to get some treasures. Or that ridiculous one at the start of the first level in the 5th chapter, where you had to "push" the box out of the way, then hit the tiny exposed corner of the jump pad just right so that you made it up to the spot instead of missing and dying instantly. Then those challenges where the only way you could get enough gold for was to do that incredibly difficult juggling thing with the Painkiller, so the corpse would drop rings and stuff. Hated those. Okay, uncanny is as uncanny does, but I felt I had to show up and point this out: Painkiller (Black Edition, to be specific) has been on sale at Good Old Games for about a year now. Now I wasn't going to go to the trouble of registering just to point that out, but no sooner does I-Mockery mention the thing when GOG puts it on sale (you can't see it on the page because GOG's weird like that, but trust me, it's $2 off). So I figured it was worth the trouble of registering to say that you're some kind of Halloween-sale-genie, and I thought you outta know.